Would you like a Christmas tree up at our? You can! We put all the Christmas trees in the shed and so you can pick out a Christmas tree without you getting wet by snow or rain. 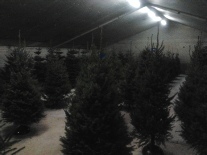 The trees are harvested fresh from our nursery, so the tree will last longer. We also sell the EasyFix. 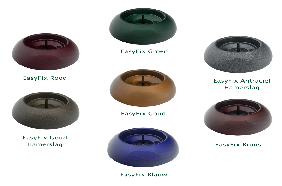 The EasyFix can be done under your tree with a hole in the tree that we create for you. 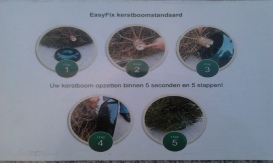 We stabbing the pin of the EasyFix in the hole of the tree and voila, the tree is ready to be used. Put in the room We have them in different colors.